This book ate one whole day out of my weekend. I could not put it down. I thought I'd read a couple chapters before bed—I ended up reading 14. The next day, I finished it. Literally did not do anything except sleep and eat breakfast between both readings. If that’s not an endorsement of how enthralling the world in The Hundred Thousand Kingdoms is, I don’t know what is. Interestingly, though, the beginning didn’t hook me right away. For one thing, I'm not generally a fan of first person stories (I know, I know, I keep saying this lately—but I’m really not!). Secondly, the main character seemed a little flippant to me at first. I felt the author intrude when the narrator starts Chapter 3 by saying "Should I pause to explain? It is poor storytelling." I was thinking, why yes, it is! And if the author knew that, then why did she do it? Perhaps it was just me reading the book more as a writer at that point than as a reader. Perhaps I still wasn’t fully immersed in the world yet. But I think it's one of the few flaws of this book: How frequently the beginning flips back and forth between present action and exposition. I especially enjoy stories where you're not sure who your enemies and allies are. Stories where a friend becomes an enemy are interesting for the betrayal. But even more interesting, to me at least, are stories where an apparent enemy is actually an ally. The Hundred Thousand Kingdoms features all of the above. Anyway, I could go on and on about things I love in the story, but the best thing to do is to pick it up yourself! I haven't devoured a book this quickly in years. I can’t remember the last time I read a book in a day, so yeah. Stop reading this and get thee to a local library/bookstore! 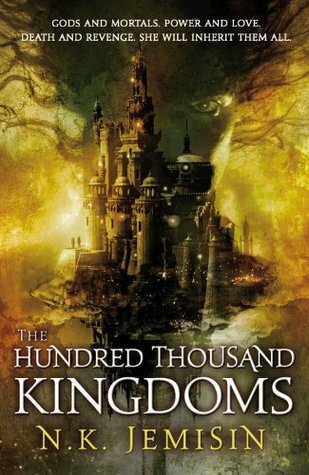 Sign into Goodreads to see if any of your friends have read The Hundred Thousand Kingdoms.